As a blogger, I spend a decent amount of time trying on new trends and testing out new ways to wear things. However, I think it's the classics that are really worth investing in. From timeless trench coats to accessories I'll always adore, I look to staple pieces to make up most of my wardrobe. You know what I'm talking about. It's the styles that you'll love for years—if not decades. One of my go-to classic brands is REPEAT Cashmere. Like this button-down I'm wearing here, all of their pieces are both versatile and high-quality. 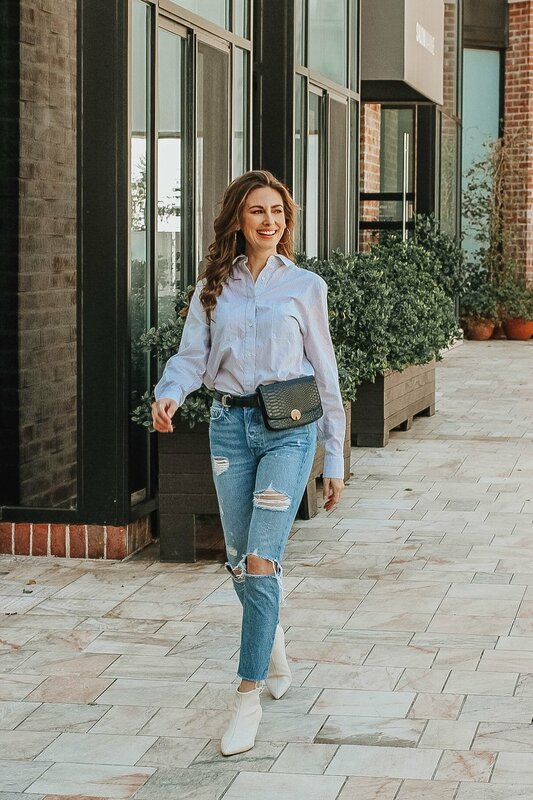 Today I paired their top with ripped skinnies, spring booties, and a trendier belt bag for a look that's great for the office. However, it also works well layered over a tank, tucked into a mini skirt, or even as a beach coverup!